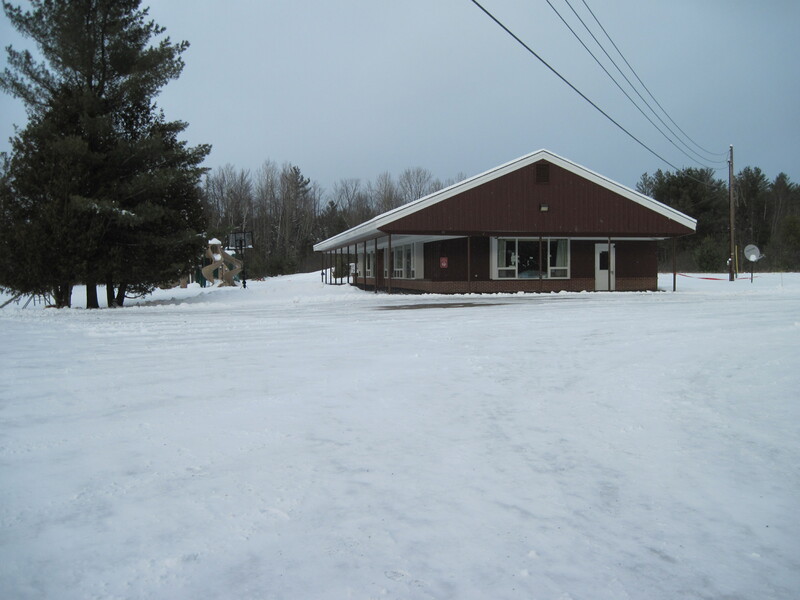 Warned Articles, Guildhall, Vermont: School Boards, Road Commissioners, and Recreational Subsidies. 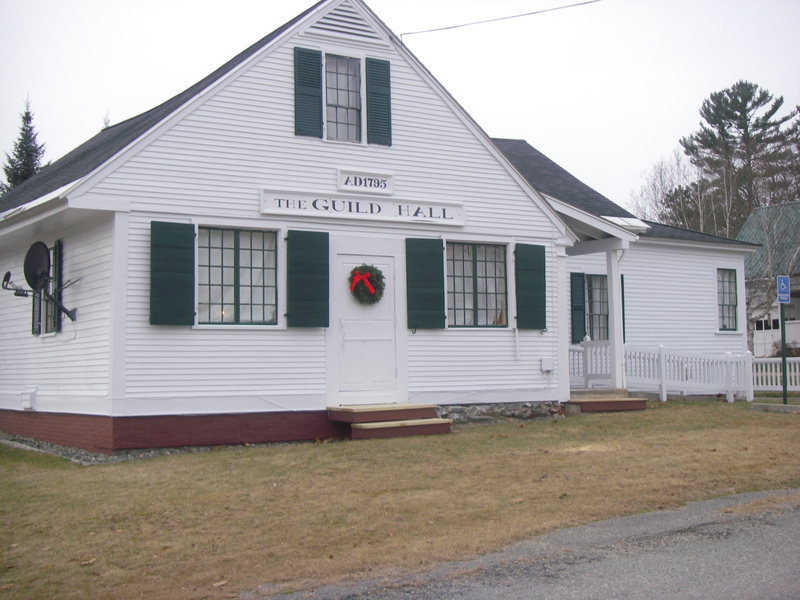 The Guild Hall, where our Town and School District meetings take place. But quite often, there is at least one or more Articles that represents a substantive question worthy of debate or an actual controversy. Increasingly in most Vermont towns, warned articles appear as ballot questions only, so there is no live debate. But here in Guildhall, we still have a live evening Town meeting, in which all the Articles on the warning, including the Town and School budgets, are discussed and immediately voted upon. The majority of Articles pass without so much as a comment or even a pause. But others generate strong, and sometimes passionate debate. Here are four examples of specific Articles that appear on our warning this year, ones that I anticipate will provoke at least some serious discussion and perhaps disagreement. I’ve provided my own assessment and opinion of the merits or demerits of each article, just for the sake of blog debate! 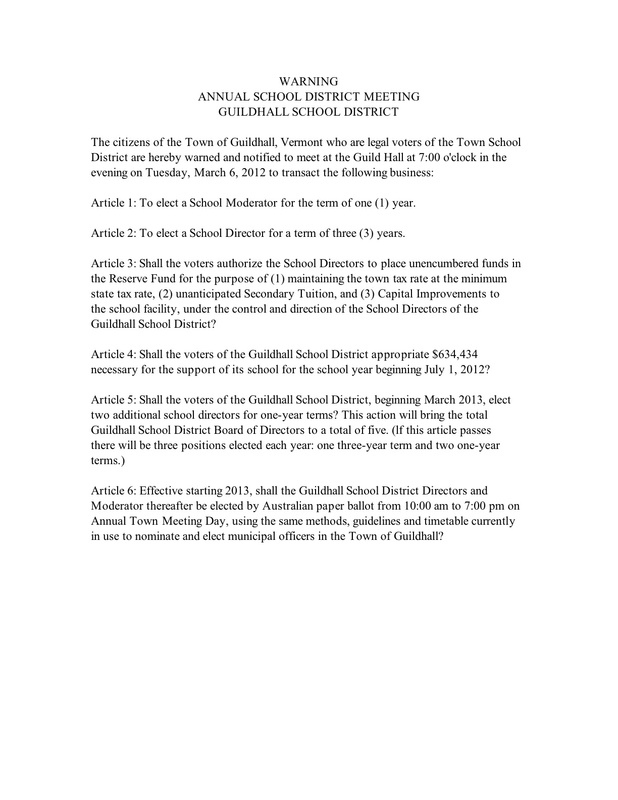 School District Article #5: Should the Guildhall School Board expand from 3 members to 5? Or, phrased another way: does size matter? This article, proposed by School Board clerk Helen Martin, asks if the voters want to see an expanded school board membership. In considering whether to expand the School Board, it’s key to bear in mind the following facts: We have one K-6 school here in Guildhall. It consists of two rooms and a total of 21 kids. Yes, 21 kids. There are two full time teachers, two full time para-educators, one full time cook, a part-time janitor, and separate part time teachers for music, art, and phys ed. Lynn Berry, a Guildhall citizen, made an excellent point in her recent letter to the Caledonian Record. The issue with our School Board is not, she commented, the number of Board members, but rather how the ones we already have conduct themselves in office. In short, School Board members can behave lawfully or unlawfully, no matter how many of them exist. Let’s focus on electing School Board members we can trust to carry out the business of our school district fairly and honestly, before we think about adding more. I say VOTE NO on School District Article 5. School District Article #6: Should the voters elect School Board members by Australian ballot, rather than the current “from the floor” system? This article appears on the warning via citizens’ petition. Decades ago, on the Town side, we went from electing officers “from the floor,” to electing them by secret paper “Australian” ballot. Under that system, more voters can participate, since the hours for voting are 10am-7pm, and more important, candidates must declare their intention, in writing, 5-6 weeks before Town Meeting, via nominating petitions. That way, voters can know well in advance who is running, have enough time to reflect and consider, and have the opportunity to ask the candidates questions. However, for some reason, our School Board has remained a “from the floor” system to this day. It makes for confusion and general chaos during the School District portion of the meeting. Most people in attendance at the evening meeting have no idea who is running for the office until the moment someone nominates them. Depending on whether or not the vote is conducted by hand count or paper ballot in the hall, there’s usually about 15 minutes at the most to think about it before casting your vote. Not exactly enough time to mull your decision over carefully! If we want to make thoughtful, informed choices as to who will oversee our kids’ education, we should take the election process as seriously as we do for Selectboard members on the Town side, and go to an Australian ballot system. In my opinion, vote YES for School District Article #6. 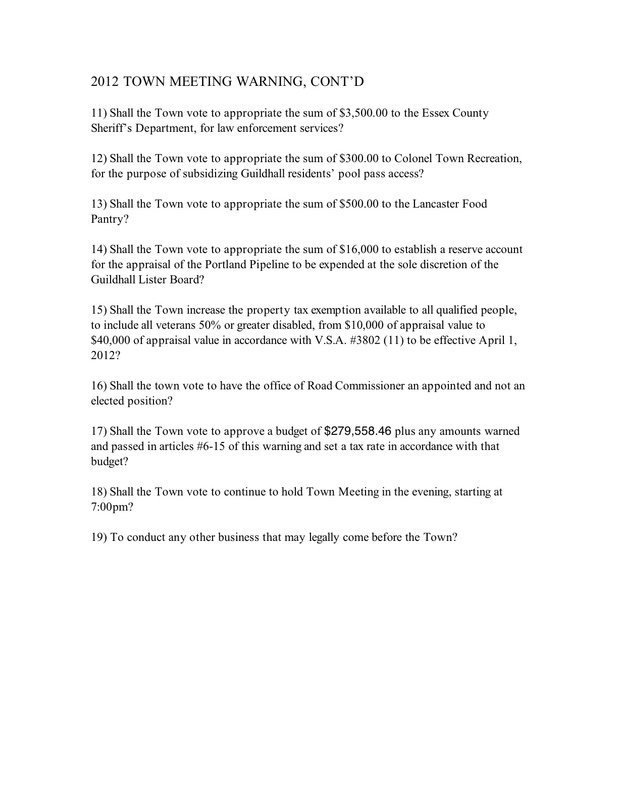 Town, Article #16: Should the Town Road Commissioner be appointed by the Selectboard, rather than elected by the voters, as it currently is? For me, this one’s a closer call. There are some compelling arguments in favor of appointment as well as election. The first thing to bear in mind is that under Vermont law as I understand it, most elected town officers are autonomous and accountable directly and exclusively to the voters. The Selectboard has virtually no power to tell the Town Clerk, the Treasurer, the Auditors, the Listers, or the Delinquent Tax Collector how to do his or her job. However, not so with the Road Commissioner. My understanding is that the Selectboard is directly responsible for the maintenance of Town roads, and that they have the express responsibility of supervising and directing the activities of the Road Commissioner, whether she is elected or appointed. One advantage of an appointed Road Commissioner is that it provides wider options for qualified candidates. The Selectboard can, I understand, consider anyone, even from out of town, to be the Road Commissioner. On the other hand, when the RC is elected, the Town is generally limited to electing Guildhall residents who are registered voters and who have chosen to run and place their names on the ballot. I’m all for local control, but the reality is that road maintenance is arguably the most important function of municipal government and I’m not entirely sure that role should be restricted to such a small field of candidates. Appointing the RC could expand the field of qualified applicants considerably and therefore go a long way toward making our road maintenance more professional and better-equipped. The appointment route strengthens the hand of the Selectboard in selecting and supervising the Road Commissioner. Since the Selectboard has that responsibility anyway, it might very well make sense to formalize it. However, it means vigilance and careful thought on the part of the voters. If we go to an appointed RC, it means that when citizens cast votes for Selectboard members, they are also, in essence, electing them for their ability to choose a competent and qualified Road Commissioner. Under an appointment system, if you don’t think a particular SB member is capable of choosing a competent Road Commissioner, you should vote for another SB candidate who you think can and will. Of course, the flip side of the equation is this: If the voters aren’t ultimately happy with the performance of the Road Commissioner that the Selectboard appointed, the voters have no recourse except to elect new Selectboard members who will make a different choice. (But of course, that’s in large part what representative democracy is all about anyway). So there may be an advantage to keeping the Road Commissioner directly elected by voters. Still, it’s worth remembering that under a direct election system, your options are limited to whomever lives in town, is registered to vote, and is willing to declare themselves as a candidate. In short, there are trade-offs either way. As I said, it’s a close call. Right now, I lean toward appointment of the Road Commissioner–voting YES on Town Article#16— as the better alternative, because it will strengthen the Selectboard’s hand and provide better options and more flexibility in bringing professionalism to the maintenance of our roads. 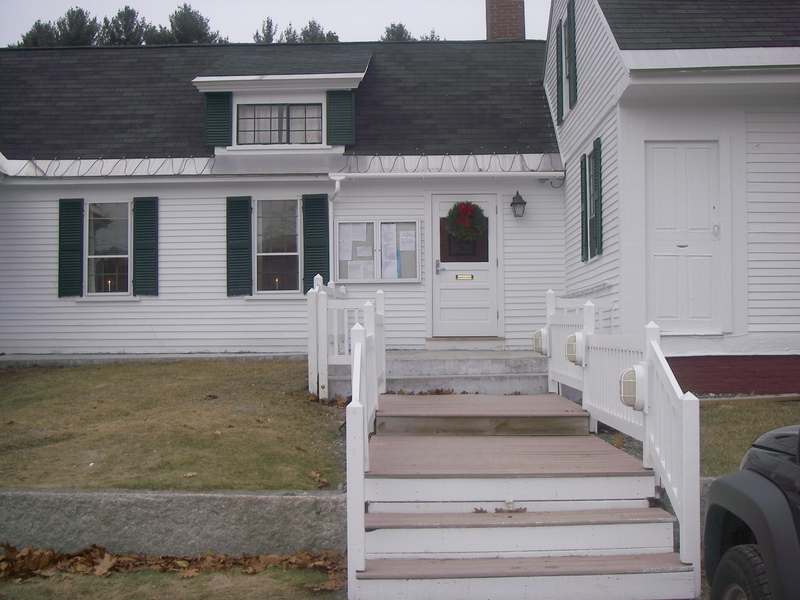 Town, Article #12: This Article asks the voters to authorize a sum of money to subsidize Guildhall residents’ access to the pool at the recreational center in neighboring Lancaster, NH. I support the federal subsidies and government price supports for my dairy farm neighbors in Essex County. I support the federal commodity subsidies that the local potato farm receives year after year. I’m likewise a big supporter of the generous tax breaks given to agricultural land via Vermont’s current use program. I support the state and federal aid that flows to our little elementary school year after year. (According to this year’s Town and School District report, federal and state grants make up a whopping 32% of the Guildhall School District’s revenue). I’m grateful and supportive of the over $50,000 in disaster relief that FEMA gave to Guildhall last year so we could repair our roads and stay within our budget after the devastating May 2011 floods. I also support Social Security, Medicare, Medicaid, food stamps, AFDC, heating oil assistance, unemployment benefits, and the federal Women, Infants & Children (WIC) program. Similarly, I support local appropriations for public libraries, law enforcement, fire and ambulance services, road maintenance, and even the local Meals on Wheels program for the elderly. All of these programs listed above–all of them–are necessary components of our social compact. Frankly, here in Essex County, a rural, poor and underserved county, if all such programs were to end, it would be a disaster to rival a 19th century Dickens’ novel. We’re all in this together, and government spending is one way we take care of each other. But I confess I draw the line when people seek personal entitlements that aren’t for the good of the many, but only for the few and for personal preferences rather than needs. Article #12 represents a subsidy for personal recreational interests. Is it fair? What about the children or adults who would like to swim somewhere other than the facility in Lancaster? Should that be subsidized as well? What about the kids who would rather take karate lessons? Should we subsidize that, too? What about the Tai Chi lessons that I’m thinking of signing up for next month? Should I ask my fellow taxpayers to foot the bill for that? I think most of my neighbors would say no, and frankly, I would never dream of asking. That’s why I will—again–vote NO on Town Article #12. 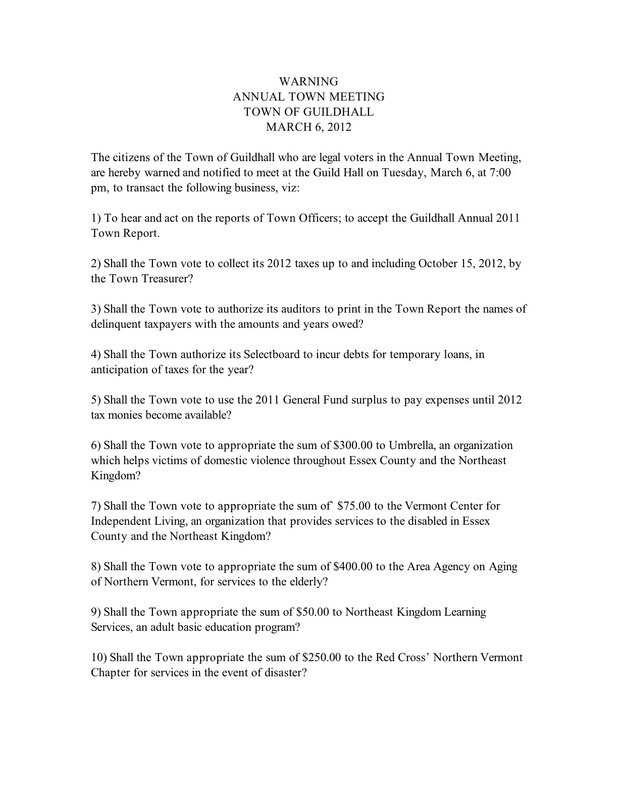 Here’s an electronic copy of the full 2011 Guildhall Town Rpt Final. See you at Town Meeting! This Land is Your Land. This Town is Your Town. “This Land is your Land.” Like many, I grew up hearing the tune as a bedtime lullabye. 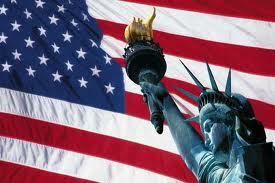 To me, it was a comforting, albeit kind of corny song about how nice it was to be an American. But as an adult, I learned it was the most patriotic song of all. It’s a simple, moving tune that has inspired people since the 1930s with the basic idea that this land belongs to us, that we are a democracy, that in America, we don’t allow people to hijack government for private advantage or financial gain. The legendary Woody Guthrie song isn’t just about national politics. It also applies right here at home, in our towns. This land is our land; this town is our town. When our local government is threatened by those who may have misused their power or failed to live up to their responsibilities, we citizens have a responsibility to take it back. In Vermont, we’re now approaching the season for Annual Town and School District Meetings. All over the state, citizens prepare to elect local officials and debate local issues. With Town Meeting on the horizon, here in Guildhall we face some serious problems. We urgently need to reclaim our Selectboard and School Board and make them accountable once again to citizens and voters. Last year was especially troublesome on the School Board side. The Board and two of its individual members are now charged with breach of fiduciary duty and violating a Vermont conflict of interest statute. They may also have violated the Open Meeting Law. Citizens also took the serious step last fall of voting to revoke a controversial gifted and talented article which many felt may have been used to improperly benefit a Board member. Our Selectboard, for its part, has degenerated into near-chaos this past year. Many questions have arisen as to possible conflict of interest in the awarding of contracts and independent contractor work, compliance with the open meeting law, the filling of officer vacancies, and the ability of the Chair to conduct himself professionally at meetings. At a recent meeting, one well-spoken citizen said: “the way this meeting is run makes me afraid to say anything or voice any concerns at all.” When a citizen says that, you know something has gone badly awry, and it’s time for a change. But we need not be discouraged. During the coming weeks, we citizens have the opportunity and indeed, the duty to rectify all this. We are Americans here in Guildhall. We will never accept the idea that one child or one family gets special or better treatment than other families simply because that child’s parent sits on the School Board. We are Americans, and we will never accept that any of our Selectboard members might give special favors or benefits based on friend or family connections. We are Americans and we believe in fairness. Let’s elect competent Selectboard and School Board members who will play by the rules and act in the best interests of the Town. Let’s elect those who will conduct themselves openly and transparently, make good faith efforts to become familiar with the basics of municipal government, behave professionally at meetings, and listen respectfully to constituents. This spring, we can take back our School Board and our Selectboard. This land is our land. This town is our town. Guildhall, Vermont, 2012.